This week’s tip for panel extenders takes you outside the office and on the road. 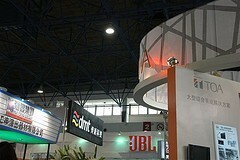 Does your company attend industry trade shows and conventions? You can easily add a sign to your booth or table with a panel extender or desktop mounted panel. Just have one custom printed with your logo. The universal brackets make setup and take down a snap and the panels can be stored and transported flat. This means they won’t take up too much space or time at your next exposition. Unlike a cheap, flimsy plastic sign, an OBEX panel is designed for decades of use with a sturdy aluminum frame and polycarbonate tile. Building a Standing Desk at Work?